In round 9, I was black against IM Ilya Sidorenko. With 6/8, I was finally back on the stage, and I was hoping to stay there this time. Up to that point, I had responded to 1.e4 with 1…e6 twice (with no success) and 1…e5 once. Against Sidorenko, I went back to 1…e5. The opening turned out to be a Ruy Lopez, Zaitsev Variation. He played the very topical 12.a3 and 13.d5 (introduced by Topalov a couple years ago, it’s essentially taken over as the main line against the Zaitsev now). That’s the position in the diagram above. Normally, after my games at these Spanish tournaments, I’d go back to my room after dinner, watch a little TV, prepare a little for my next opponent, then read and go to sleep. That’d be my routine in a normal tournament. Going into the second half of Sants, though, I was riding a wave of disappointment. My play in rounds 3, 4, and 5 wasn’t going to cut it, and the 1/3 I scored there left me with a paltry 3/5. I decided a change was in order and I almost entirely stopped preparing! Instead, I focused on “rebuilding” my brain. I was generally going to dinner with GM Mark Bluvshtein, who I got to know during my two visits to Montreal last summer. I played ping-pong with Mark a few days after the games, mostly doubles with Spanish or Israeli players in the same building. Maybe that served as a bit of an additional release for me, as my play started to pick up starting in round 6. A heffalump, for the uninitiated, is an elephant-like creature from the Winnie the Pooh series of children’s books. I think it was also used by Simon Webb in Chess for Tigers, although I forget the details of his use. After my 3rd round save, I had 2.5/3 and was unceremoniously sent packing off the stage. Back in the main hall with hundreds of players, I felt a bit like a slow-moving creature with a big target on my back. In both the 4th and 5th rounds, I found my opponents to be rather ambitious in their preparation while I foolishly fell into their traps. 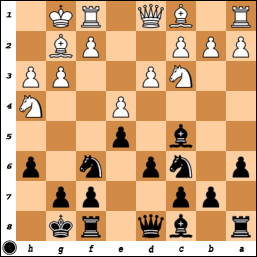 My 4th round game featured FM Lars Ootes (2315, Netherlands) with the black pieces. 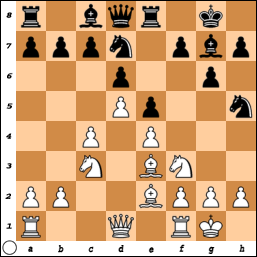 Recently this King’s Indian setup with 6…Nbd7 and 7…e5, followed by the seemingly illogical transfer of the Bg7 to e7 (via f8) and the Nf6 to g7 (via h5) has become popular. Black often loses more time because his rook has to move to e8 and then back to f8 (to support his kingside attacking ambitions) in most cases. Strong GMs like Radjabov and Bologan have played it with success, although in my view, the reasonably good score of the opening is more due to some practical considerations than any objective merits. In my last blog about Sants, I wrote how Round 1 was a let-down in terms of the quality of my play, but that I seemed to recover a little bit in Round 2. That seemed to bode well for my chances in the 3rd round, but that game was strange enough to merit its own post. I was black against FM Lluis Oms (2360, Spain). As is often the case with lower-rated players, there wasn’t a whole lot to go on in the database. I did notice that against 2500+ players, he had played for a draw with some rather insipid lines (e.g., drawing lines in the Four Knights against 1…e5 and the Exchange against the French). Unlike some of the Four Knights lines, the Exchange French at least keeps the chance of some serious play, so I decided to play the French this time. I was mostly expecting 3.Nc3 against the French though, as he had the most games with that. The game began 1.e4 e6 2.d4 d5 3.e5 c5 4.Nf3, a line that I don’t think I’ve ever faced in a regular game. A long time back, when I was about 9 or 10 years old and nearing 2200, I used to play something similar with white (1.e4 e6 2.d4 d5 3.e5 c5 4.Qg4 was what I played). Both versions are supposed to be rather innocuous, and I had no trouble in equalizing (and getting a better position). 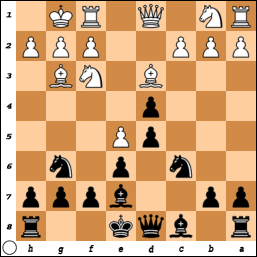 Many books on the French recommend a system where Black plays a quick …f6 (with the knight on g8), but while that my work in some concrete sense, it seems unnecessary to me. I played 4…Nc6 5.Bd3 cxd4 6.0-0 Nge7 7.Bf4 Ng6 8.Bg3 Be7 (diagram below), preparing to castle or play …f6/f5 depending on what White does. 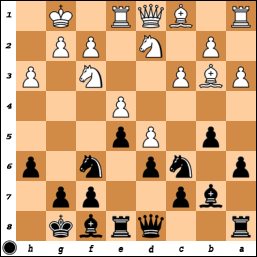 In this setup, if White exchanges on f6, Black will generally recapture with a pawn and then play …e5. With an extra pawn and a huge pawn center, the slightly weakened kingside is usually of little consequence. I blogged earlier that I was playing in Sants and had 6/8 with 2 games to go. I finished with 7.5/10, and now that I’m back in the States, I’ll start to recap the event over a series of posts. The Sants Open is supposed to be one of the best events on the summer Catalan Circuit, and it is certainly one of the most popular. There were about 360 players in the top section, which meant that the first round would feature some relatively large mismatches on paper. I was black against a 2121 in the first round, but it turned out to be anything but a mismatch. I didn’t really know much about this line of the Four Knights with 4.g3 and after his 9.Nh4 to reach the above position, I had a long think. Not a good think, just a long think.